Palacio del Marques de San Felipe y Santiago de Bejucal is a 5-star hotel that faces the central Plaza de San Francisco de Asis Square in Old Havana, fusing the colonial and modern ages and being an example of a restoration labor carried out respecting the historical and architectural values without resigning to the overall comfort. Its advantageous location in the most beautiful district of old Havana allows guests to easily reach all major tourist attractions. The hotel features a heavily sculptured baroque facade which blends flawlessly with the interior and its elegant furnishings and modern services. Famous Cuban artists are responsible for the artwork on the Hotels walls. Beautifully furnished guest rooms offer satellite international TV channels, a private safe, hair dryer, minibar, large private bathroom, telephone, WiFi and a writing desk. 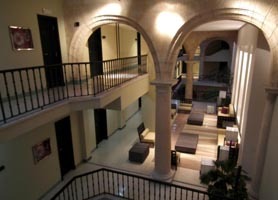 Palacio del Marques de San Felipe suites also offer a whirlpool Jacuzzi and music system. The main car rental office at Havana Cruise Terminal is just across the street. The Hotel Palacio del Marques de San Felipe y Santiago de Bejucal hotel dates back to the late 18th century, when it was the private dwelling of Don Sebastián de Peñalver. At the beginning of the 19th century the property was acquired by the IV the Marquees of San Felipe and Santiago after who is now the hotels namesake. Views afforded from the roof top terrace on the sixth floor of the hotel are spectacular and is often used by photographers visiting Havana. Guests can also use a telescope affixed to the roof to explore old Havana. 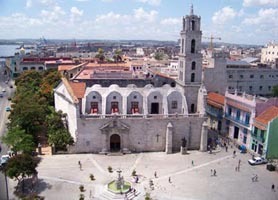 The pigeon populated Plaza San Francisco de Asis is also the location of the Convent of San Francisco de Asís, home base to one of Havana’s best concert halls specializing in chamber and choral music. 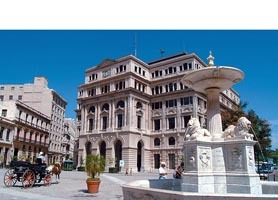 The square is renowned for its charismatic Lions Fountain, carved out of marble from Carrara Italy by the Italian sculpture Giuseppe Gaggini. Near the fountain you’ll see the epic bronze statue of El Caballero de Paris, one of Havana’s most appreciated past residents. Palacio del Marques de San Felipe y Santiago de Bejucal Hotel Old Havana is usually in very high demand and, as such, should be booked in advance. Our booking program allows reservations at Palacio del Marques de San Felipe y Santiago de Bejucal hotel without down payment or deposit which will guarantee your dates and also allows preferential modifications should your dates change in the future. 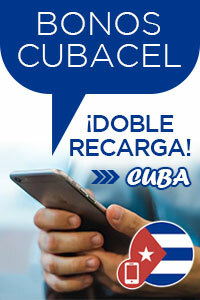 Our booking process is unique because it shows the best rate from all of these for Palacio del Marques de San Felipe y Santiago de Bejucal hotel in Old Havana and the types of rooms available. Our Palacio del Marques de San Felipe y Santiago de Bejucal Hotel Old Havana rate comparison is an industry first for Cuban Hotels. Once you’ve compared the rates, finalizing the booking at Palacio del Marques de San Felipe y Santiago de Bejucal Hotel takes just seconds and an immediate confirmation is provided in real-time.